C is a little over 8 months old. 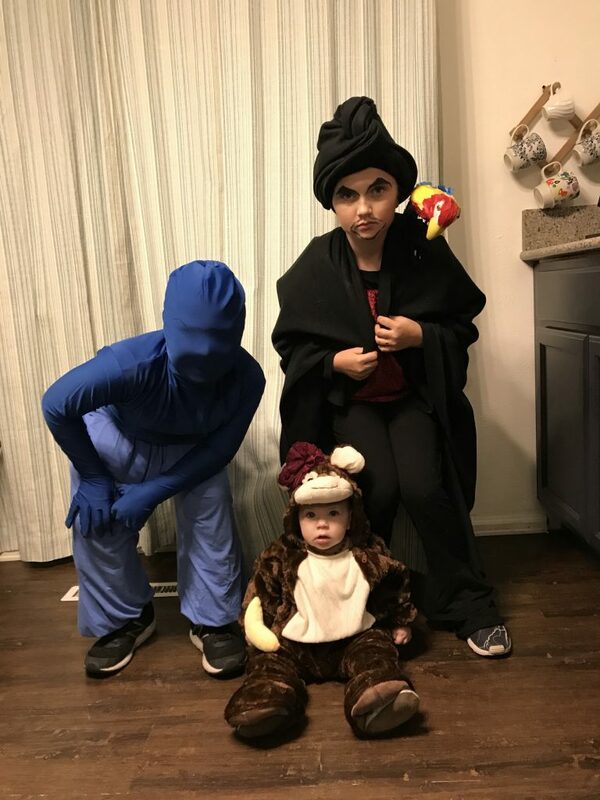 She just participated in her first Halloween as Abu, from Aladdin. It was pretty adorable, just look at the picture above and you can see. You might remember that about 12 weeks ago we took her to the Hearing Clinic at our local Children’s Hospital. You can read about that experience here. Through August and most of September, I was able to put it out of my mind. However, October rolled around and so did the questions. Is it genetic? Will future children have whatever she has? To be honest, I was excited. I’m a cause girl, an information seeker. I knew that as soon as I received the test results that would (hopefully) have a reason for C’s hearing loss, that I would research. I would become an expert by talking with the experts, by learning. We had been warned by the Genetic Counselor at hearing clinic that we might not get any answers. I told her then that if the tests came back negative for the 152 different genetic reasons they could test for (out of 400ish) that I would have received 152 answers. Our letter came yesterday and that is exactly what we got. Coupled with CMV, we now know 153 reasons that are NOT why our child is Hard of Hearing. It was a bit of a tough pill to swallow. I like answers. I don’t do well with the unknown. It’s my personality. I guess C is going to help me learn how to do better with that. Now what am I supposed to do? How should I move forward with C? Well, I am definitely going to be pushing for the eye appointment at Children’s. Vision loss is often experienced at the same time as hearing loss, and I want to be sure that this isn’t an issue. I’m definitely going to keep watching her ear’s like a hawk – we have already had two ear infections and the third means a trip to the ENT. Other than those things… I keep doing what I’m already doing. I learn ASL through a once a week “Hearing Therapy” provided by the state. I practice it daily. E definitely helps with that when he chooses to be nonverbal. I read a lot to C. I need her to pick up as many sounds that we make as possible. I put the hearing aids in every morning. Even though she takes them out while she crawls around and I then freak out looking for them, praying the Roomba which she started hasn’t eaten them! Maybe one day, we will have the reasons. In the meantime, this is my life. I definitely know what you mean about wanting answers. I’m sorry you didn’t get one. That must be really hard. It sounds like you’re really doing a great job of deciding what to do next and moving forward to keep doing your best for C.